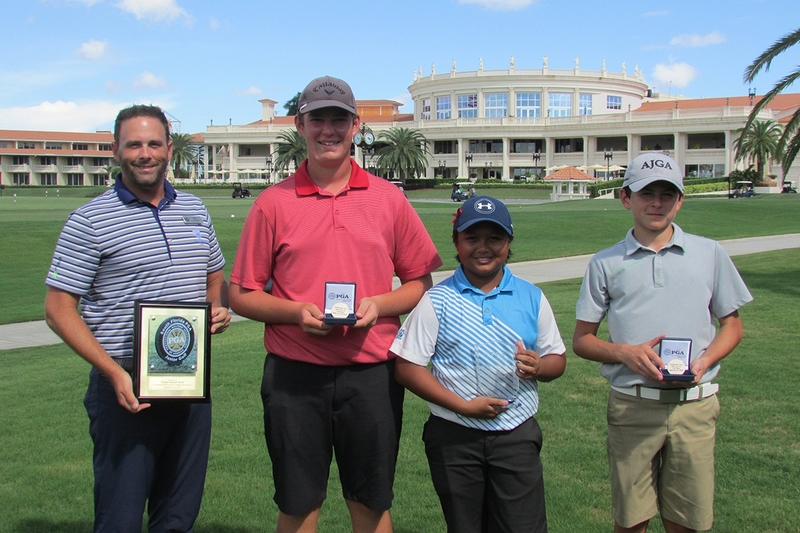 September 23rd 2018 - ATLANTIS, Fla. – This week, the South Florida PGA Junior Challenge Tour presented by The Honda Classic held Challenge Tour Event #10 at Trump National Doral in Doral, FL. Juniors faced two brutally hot days on the demanding Red Tiger golf course. The boy’s division featured some excitement this weekend that rivaled Tiger Woods capturing his 80th victory. John Marshall of Miami, FL fired an opening round 75. Marshall came out hot on Sunday and fired a final round 3-under-par 69. NaShawn Tyson of North Palm Beach, FL shot rounds of 74-70 to force a sudden death playoff with Marshall. The playoff would turn into a duel between the two. On the third playoff hole, Marshall hit his approach into the par-5 into the water. After taking a drop he was able to hit it to within 8 feet and save his par to match Tyson’s par on the hole. On the fourth playoff hole, Marshall stuck his approach shot to ten feet. Tyson’s approach would ended up 50 feet away on the fringe. Tyson would roll in the long birdie attempt and Marshall was unable to answer, giving Tyson the victory. David Miller of Davie, FL would take home the boy’s 16-18 age division. Kelly Shanahan of Coral Springs continued her winning ways this weekend. Shanahan fired rounds 75-74 to capture the Overall Girls’ Title by eight strokes. This is Shanahan’s 4th win of the season. Gloria Nip of Port St Lucie, FL took home the girl’s 13-15 age division, while Briana Fitzpatrick of Port St. Lucie, FL took home the girl’s 16-18 age division. Polina Anisimov of Port St. Lucie, FL took home the girl’s 11-12 age division after rounds of 82-80. Pavel Tsar of Palm Beach Gardens, FL took home the boy’s 11-12 age division after a three-hole sudden death playoff victory over Doral, FL native Victor Herrera.